Students display their art and writing projects for the Dig Your Neighbourhood: Mission launch, taking place Saturday, April 18, from 3 to 5 p.m., at the Marmalade Cat Café, 2903 Pandosy St., Kelowna. 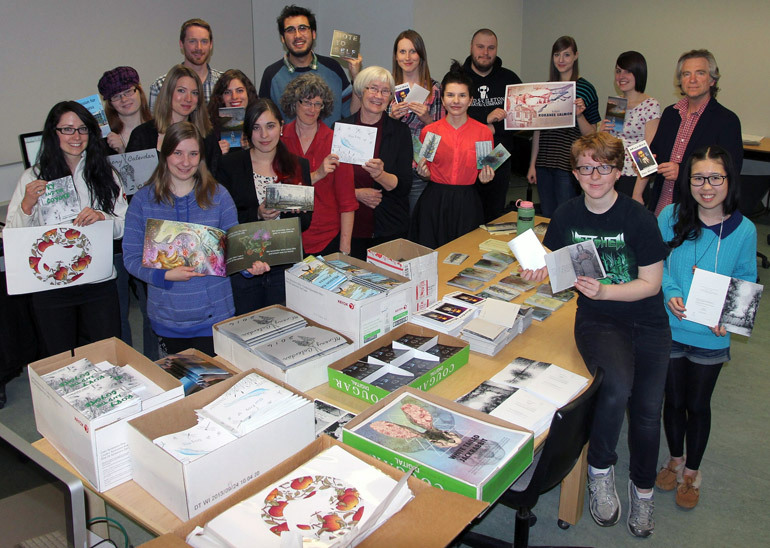 When: Saturday, April 18, 3 to 5 p.m.
UBC Okanagan students in Creative Writing and Visual Arts will launch 15 new works about and for the Mission neighbourhood of Kelowna. Dig Your Neighbourhood (DYN) is a project in the Department of Creative Studies, where students create a package of art for a Kelowna neighbourhood which is then distributed by the Welcome Wagon Ltd.
“The students will be launching the new package created especially for the Mission and it is spectacular,” says Assoc. Prof. Nancy Holmes. Items include two children’s books, a “fitness guide” to the Mission, a package of meditation cards, a winery calendar featuring Mission wineries, placemats, greeting cards, illustrated books, and much more. The package will be unveiled on Saturday, April 18, 3 to 4 p.m. at the iconic Marmalade Cat Café, a Mission landmark. The event is free of charge. All are welcome. There will be a draw for packages and selected items will be on sale. Meet the student artists and be there for the "handover" of several packages to the Welcome Wagon. This project was directed by Holmes and Visual Arts Asst. Prof. Aleksandra Dulic, with financial support from the Eco Art Incubator and Lake Publishing Society.